BOOST YOUR RUSSIAN WITH THESE TRIED AND TESTED ONLINE COURSES. STUDY IN THE COMFORT OF YOUR OWN HOME, ON YOUR OWN SCHEDULE, WITHOUT PAYING EXPENSIVE PRIVATE TUTORS. 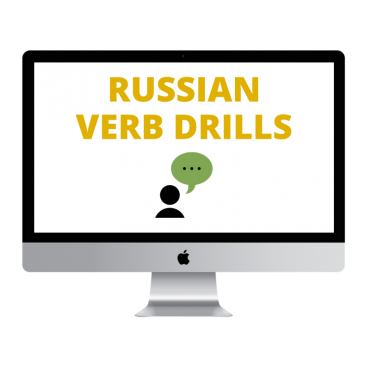 The Russian Verb Drills course is designed to help you memorize different verb forms, their correct pronunciations and, most importantly, to gain speed when it comes to speaking Russian with the help of unique Russian verb conjugation AUDIO DRILLS. You´ll be drilling (orally!) on the most popular Russian verbs in both aspects and three tenses until the correct verb form comes naturally to you, without even thinking. By the end of the course, you will have finally memorized different verb forms and gained speed when it comes to saying them, so that speaking Russian becomes less stressful and much more pleasant. You will be able to get rid of those awkward pauses while you try to remember the correct verb form when you speak Russian. 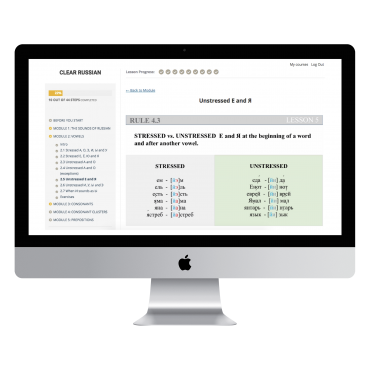 Skyrocket your learning effortlessly through reading and listening and soon you will be able to understand native speakers, no matter how fast they speak! 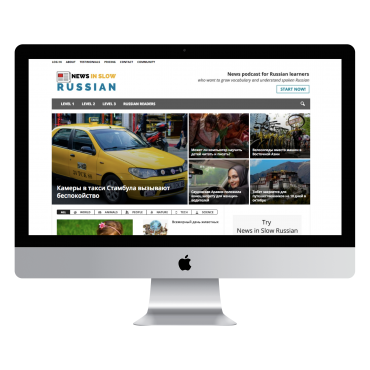 News in Slow Russian is a step-by-step course that will bring you from understanding zero Russian to clearly understanding Russian speakers, movies and songs and gaining an extensive vocabulary of 5000+ common words and phrases, enabling you to use Russian with confidence. This course is specifically designed for Russian learners who want to study at home, at their own pace, using compelling content that is appropriate for their level. Make your Russian sound clear and distinct, so there is no confusion about what you are saying! However, there is no such thing as “simple pronunciation”. If you don’t have good pronunciation, you have bad pronunciation, and we want to make sure it´s the former! It´s crucial to START with mastering pronunciation and THEN focus on grammar, vocabulary and everything else. It´s time to do BIG things. It´s time to achieve the level of Russian that you´ve always wanted. It´s time to understand native Russian speakers and be able to watch movies and read books in Russian. Boost Your Russian courses give you tools to achieve all of this, whilst studying at your own pace in the comfort of your own home.